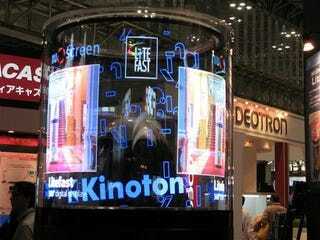 Technohouse showed off the Lifefast, a radical transparent, 360 LED display unit at the Inter BEE 2007 fair in Japan. Placed at right angles to each other in the Lifefast's cylindrical design are four bars, each fitted with 600 three-color LEDs, which revolve between 12 and 13 times per second, flashing up images. More info and pics below.